Left: The Posi lock support in the "open" position. Right: The Posi lock in the closed position. 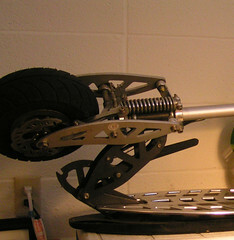 The posi-lock system is the "trademark" of Evo Powerboards1 and can also be found on many of the Bladez and Tanaka scooters. This folding/locking system was created as a design improvement over similar mechanisms designed by Goped® which left the steering support pole less than securely attached to the front fork. The rigidity of this design is unmatched in the scooter world. 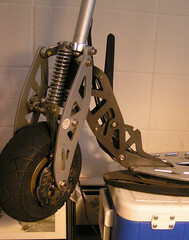 Though the posi lock style support fold only connects on one side of the scooter, and the lighter side at that, it has plenty of strength to be able to lift the heavy engine side of the scoot with relative ease. In order to release lock in order to change the position of the support, the black rubberized handle must be pulled away from the support shaft. This releases the cog holding the support in place and will allow you to rotate it to a new position. 1. According to the evopowerboards.com site.